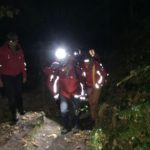 The volunteer members of Cleveland Mountain Rescue Team were called out for the 69th time this year on Monday evening, October1st for what proved to be one of the most challenging incidents of recent years. 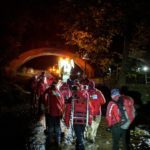 The incident began when two men from Lincoln were spending a couple few days walking the Esk Valley Walk from Castleton to Whitby. 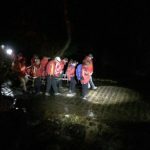 Around five o clock on Monday evening one of the men lost his footing on the path near Glaisedale and began falling over the cliff edge that dropped around 10 metres into the River Esk. As he fell he was grabbed by his friend so the two of them slid down the cliff to be stopped by trees and bushes on the water’s edge. The incident happened around 200metres from the nearest road along a track through the woods near Glaisedale Station. One of the two managed to raise the alarm with his mobile phone and alerted the ambulance service who in turn alerted the rescue team. 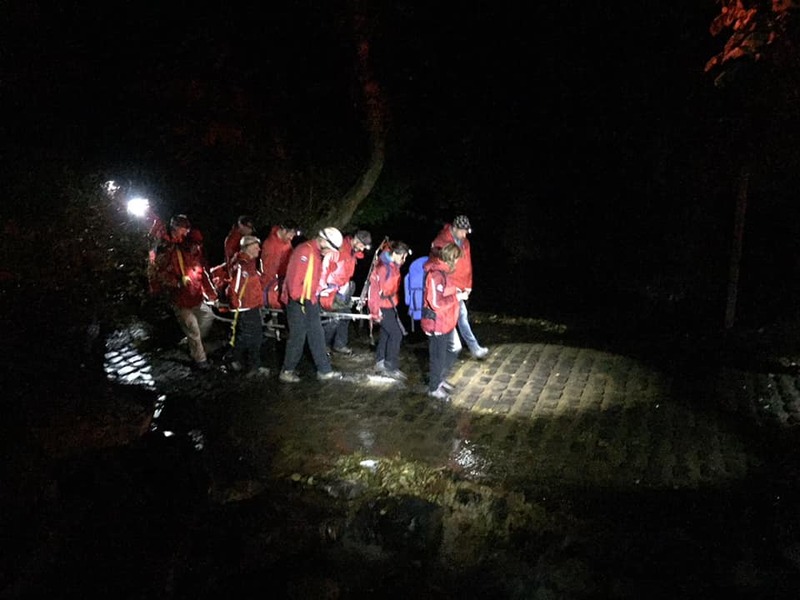 A member of Cleveland MRT who lives in Danby was first on the scene and quickly assessed the condition of the two walkers and it was decided that one of the men could walk out with assistance along the narrow path alongside the river whilst the second had potentially more serious injuries and needed evacuation on a stretcher. 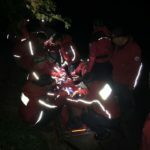 After a tricky operation on the slippy, narrow path alongside the river the man was immobilized on one of our specialized stretchers and maneuvered to where he could be carried back up the cliffside by means of a backup rope. He was taken, by the ambulance service, to James Cook Hospital for treatment. The incident lasted nearly four hours and involved 24 mountain rescue volunteers. Great team work… we even got to clean our boots as we carried one gent to the waiting ambulance through the river ford.